Now in its 7th year, Camp Bestival continues to grow and expand and establish itself as the family festival of the year, each year. Set in the grounds of Lulworth castle in Dorset, the fields are surrounded by forest and ocean, giving the site an isolated feel while providing stunning scenery. It is highly recommended to make the most of the area on the Thursday before the festival itself begins or a few days either side. There are many little villages and the cove nearby to see, or a short drive will take you to Weymouth or Bournemouth. Often on a Sunday we would drive into Wareham for Sunday roast at the local pub, this year we took an extra day and visited the cove, which has a trail to follow, and visitors centre detailing the Jurassic coast. 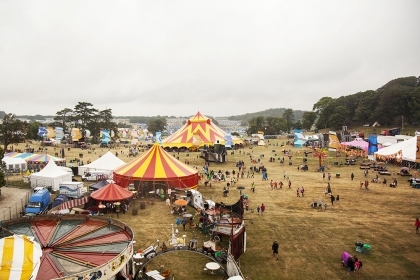 The festival site itself is laid out similar every year, with the kids field behind the castle, keeping all the activities in one are, and the bars, main stage and big top in front. Wagons, pushchairs and trolleys are easily manoeuvred around the site and there is plenty of room for little people to run about. This year Camp Bestival introduced The Den, an area for teenagers only aged 13-17, which provided music, activities and a place to chill out. Last year we wrote that we had issues with groups of teenagers being anti-social and creating an uncomfortable atmosphere, however providing them with a place to be, and occupy themselves really changed the atmosphere this year. There were no large groups of teenagers hanging around the campsite and those who were seemed to be with family. This is what makes it so ideal and sets it apart from other festivals, as a family destination as opposed to a party destination. It also enabled teenagers to have a space of their own and more independence while creating their own festival experience. The general feel of the festival this year was really enjoyable, with time to relax, be busy with the kids and listen to music. General facilities were exactly as you’d expect from a festival, however, there seemed to be a lot less toilets this year in the campsites, and there were increasingly long cues for the ones around the main stage and in the kids field (Children have there own loos and so they did not have to wait as long) and as such for the women I would highly recommend a she-wee or other device to use at night and first thing in the morning to keep in your tent. The music this year was definitely extremely eclectic with the three main headliners being Basement Jaxx, De La Soul, and James. Sadly we’d have to say that even with this vast mix of genres the line-up was lacking the spark it used to have 2008-2012 and could have been a little better. And there were other decent acts such as Dan le Sac vs Scroobius Pip, Kitty Daisy & Lewis, The Cuban Brothers, Beans on Toast, Mr B. But all these acts have played both or one of Camp Bestival and Bestival every year! We found that the line-up didn’t run as smoothly as previous years also, with acts running up to 25 minutes late, last minute changes being made to time slots which messed up the programme costing punters £10, For example The Radiophonic Workshop being moved from Sunday in the Big Top to Saturday on the Main Stage. Also a few acts cancelled, one being a biggish name on the line-up ‘D-Ream’ who had a couple of big early 90s hits. Highlights this year included the science tent (which has been around each year), in which kids could create and learn about circuits, and make their own soap, so no excuses for muddy faces while camping. Another highlight we’d like to mention was the new stage Matua Sessions. Was a great little bar area to relax or have a dance that we found to be often hosting blues bands. The only downside was that they only served wine. Sadly many of the food stalls and activities had run out of stock by the Sunday afternoon, which was a little disappointing and the national trust was booked very quickly. More facilities for these activities would be an improvement, as although Sunday is the last day, it shouldn’t feel like it. We found this year many people had packed up and left either on Saturday night or Sunday afternoon and the campsite surprisingly started to look bare by Sunday evening. Additional activities, and a larger act may entice people to make the most of the weekend and stick it out right till the end like they should. This time last year we were quite disappointed with Camp Bestival, however this year was so much fun, the atmosphere greatly improved that we will no doubt return! Though I would say that the line up does need a bit more flare in it, like it used to have. Many thanks to all over at Camp Bestival, and the amazing PR guys from Get Involved for inviting our family back for the 7th year in a row! Written by Alan Thomas & Samantha Jones.